What quenches your thirst? Wealth or health? Career or activities? Or do these things still leave you with a certain level of dehydration? Perhaps right now you’re experiencing a detour through a spiritual desert. Perhaps you see the dry, cracked road ahead and feel like giving up. Perhaps you’re new to Christianity and uncertain about how to live your new life in Christ. Take heart. Jesus offers the goodness and grace that quenches. He shows you the path to streams of living water that will quench your soul s thirst. He doesn’t care where you’ve been. He doesn’t care what you’ve done. He cares about you. Jesus is the Living Water that hydrates from the soul out. He said, “Everyone who drinks of this water will be thirsty again, but whoever drinks of the water that I will give him will never be thirsty again. The water that I will give him will become in him a spring of water welling up to eternal life” (John 4:13 14). 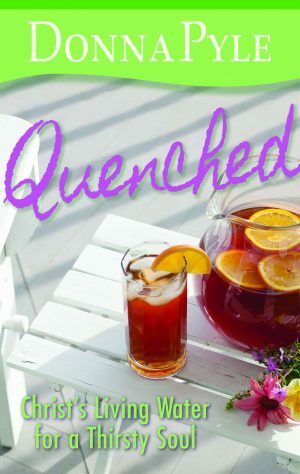 Quenched: Christ’s Living Water for a Thirsty Soul is for both new Christians and Christians going through spiritual dehydration. Author Donna Pyle has been both new Christian and tired veteran Christian, so she writes from first-hand experience. Her been-there-done-that approach to affirmation and encouragement is welcomed by readers feeling confused or ashamed about living out their witness to Christ. Regardless of the state you’re in, you will be lead to the life-giving waters of Christ’s grace, mercy, and hope. Pyle writes with honesty and humor as she points readers to the Gospel message of forgiveness and salvation, and emphasizes that it is only Christ and His grace that quench the parched soul.